It’s a common request of schools and other institutions for you to include your name and a page number at the top-right corner of your document. This serves several identifying purposes, including the ability to make it much easier to put a document back together in the event that its pages become separated. 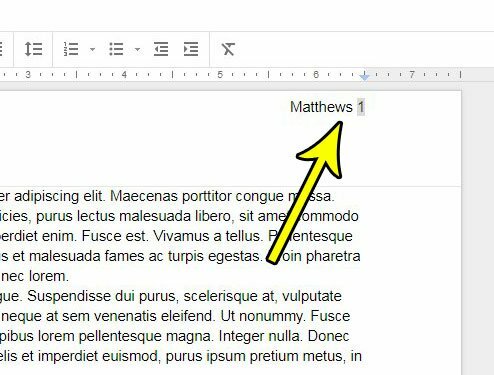 While many places will provide instructions to do this in Microsoft Word, you may be wondering how to add your last name and page number to the top-right corner in Google Docs. 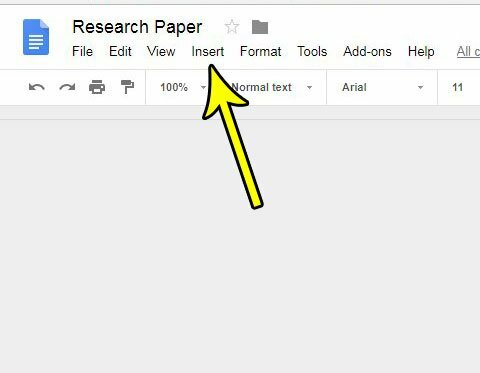 Luckily Google Docs gives you control over the header section of your document, which is where you will need to place this information. There is also a helpful tool that aids in putting the page number in that location. 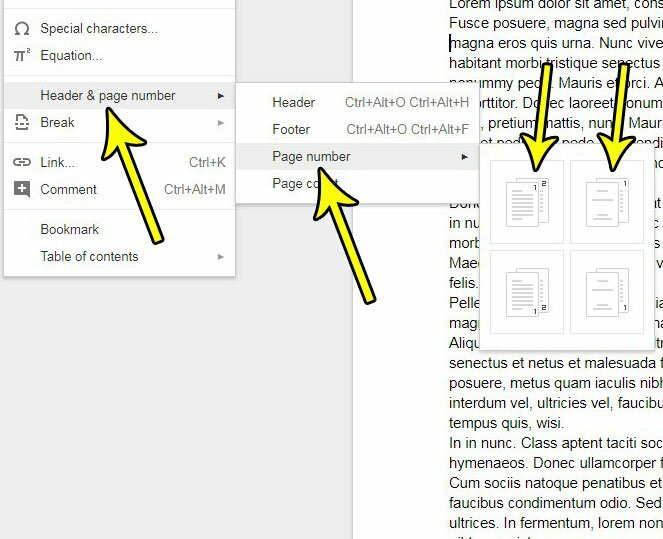 Our tutorial below will show you how to first add a page number to the top-right in Google Docs, then we will show you how to add your name next to it. The steps in this article were performed in Google Chrome, but are the same in other Web browsers on your computer like Firefox or Internet Explorer. The steps in this guide will show you how to include both a page number and your last name at the top-right of every page in your document. The page numbers will adjust to display the correct page number on each page, but your name will remain the same. Step 1: Open Google Drive and open the Docs file to which you wish to add your name and a page number. Step 3: Select the Header & page number option, choose Page number, then click the top-left option if you want to number every page, or click the top-right option if you want to start numbering on the second page. Step 4: Click to the left of the page number in gray at the top-right of your document, then type the name that you wish to use there. You will probably also want to type a space after the name to have some separation between the two elements. Did you make some changes to your document, only to decide that you liked it before? Find out how to view and restore an old version of a document if you’ve made too many changes for Ctrl + Z to be effective anymore. What Version of iOS is On My iPhone?